Raindrops plopped on canoe shaped leaves, yellowish and faded. 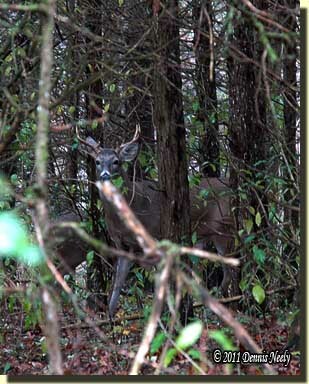 As the droplets struck, small dust clouds arose from old hoof prints on an earthen doe trail. Hook-shaped turkey leavings, dry, hard and brittle, rested here and there along the path. Mid-November, in the Year of our Lord, 1797, saw little moisture. My buffalo-hide moccasins stalked a high knob. The red cedar trees grew tight, so tight only the very top boughs were green. This was a spot known only by the deer and the wild turkeys, and from the looks of two sandy piles, maybe the woodchucks, too. I hunched in half as I followed the trail, and even then scraggly dead branches tugged and clawed at my linen hunting shirt and buckskin leggins. In another dozen steps, I held the high ground. The bedroll dropped with an almost imperceptible “whoosh,” and as I sat, raindrops pitter-pattered all around in a syncopated melody that stood out against the background rush of the evening’s gentle drizzle. The air smelled of the late-August moisture that always tempers July’s scorching drought. Blue jays flew into the tangle from behind, from the east, jaying in a half-hearted attempt to warn the forest of a mystery intruder that they somehow lost track of. Within a few moments the alarms crescendoed to a deafening din. I lost count at eleven blue jays, but none screamed close to that hidden knob. I found that knob many years ago when the trees were not as thick, and then for some reason, I abandoned it. In the fall of 1795, I rediscovered it as I trailed behind a seven-pointer. Not quite to the hill’s crest, the young buck froze and tested the air for the longest time. On that day, I dropped to my knees, then sat on my heels as the creature sifted through the fluky, unpredictable winds of the knob’s west slope. In the days that followed, I worked the deer trails that crisscrossed below the knob, paying special attention to the breeze. On one occasion, perplexed as the seven-pointer once was, I walked to a spreading cedar tree that grew on the knob’s crown, hacked a sitting area from within its lower branches and sat down with intentions of sifting out the wind currents. To my surprise, I found that the wind always rose straight up. As I scribbled notes on a parchment page, I speculated as to whether this was the haunt countless old bucks disappeared to, old monarchs that slipped away whenever I ventured through the slight valley below. As I sat in the drizzle that evening, a cow’s knee proved unnecessary, but I tucked “Old Turkey Feathers’” lock up under my right arm, just to be sure. A doe and summer fawn passed from south to north, and in a while three older does skirted the knob from north to south. At dusk a few wild turkeys navigated the various byways, all converging on a tall, roost oak that stood behind me and to my left. I counted seven birds at fly-up. I sat against that cedar for the rest of the evening, content in my invisibility, but I never saw a sage old buck. In “…a hundred howling wolves…,” I wrote about reading Darius Cook’s narrative, Six Months Among Indians, Wolves and Wild Animals, in the Winter of 1839 and 1840. Cook was a newspaper man who worked at the Pontiac Courier, the Kalamazoo Gazette and the Detroit Free Press after venturing to the Michigan Territory in 1836. Darius Cook took the doctor’s advice and enlisted a hunting companion, James Rhodes. The pair wintered in the wilderness, a little over three miles from the headwaters of the Rabbit River in northeast Allegan County. Being a journalist by trade, Cook wrote about his adventures. I shied away from the book for some time, because of the date—a full generation after my chosen time period. Many years ago I was taken to task by a respected traditional hunter for not “narrowing my research’s focus” and “relying on materials beyond your persona’s time period.” I took the dressing down to heart and concentrated my efforts on 18th-century documentation. For a while I avoided all journals and narratives that dealt with happenings beyond the century’s last decade, but I found it difficult to assimilate the life experiences of individuals whose lives spanned into the 19th-century. It was as if they all had died on January 1, 1801. All too often I hear those same words spoken to a novice traditional black powder hunter who is trying his or her darnedest to be period-correct. But the graybeards’ advice needs to be put in context. Certainly, each living historian owes an obligation to observers to concentrate on documenting his or her portrayal based on solid primary sources relative to a chosen time period, geographical location and station in life. Six Months Among Indians, Wolves and Wild Animals… is set in a specific time period (the winter of 1839 to 1840), in a specific geographical location (Allegan County, Michigan) and with the specific perspective of a unique station in life (newspaperman and journalist). Yet, there is another interesting facet to Cook’s narrative, and those of other future inhabitants of our living history playgrounds, that supports reading and researching beyond one’s era. Although his personal adventures are set forty-plus years after those of my persona, the hunting habits and practices Cook, Rhodes and their forest companions engaged in are the same as, or very similar to, those documented for the late 18th-century. I have come to embrace this “continuity of standard practice,” because it reinforces and validates many of the trial and error lessons I have learned in the wilderness classroom. I share this tale, because such stories point out the fact that the hunting practices we engage in are not all that different today than they were in the past. In essence, Cook’s evening hunt is much like the one my alter ego engaged in. The details of the resulting story know no bounds of time or place or station in life. The only governing context for this story is our own knowledge of the who, when and where recorded in the pages of an old hunter’s narrative. This entry was posted in Bear Hunt, Research, Worth thinking about... and tagged Dennis Neely, North West trade gun, Northwest trade gun, traditional black powder, traditional black powder hunting, traditional blackpowder, traditional blackpowder hunting. Bookmark the permalink. It seems to me that Cook’s hunt took place from a trestand and possibly after dark (illeagel today). My own ancesters arrived in Michigan in that time period (1844) so I am sure they had similiar experiences. I wonder if he was using bait. The “scaffold” already existed near their lodge. It is not uncommon to read of scaffolds being built to store meat or hides up and away from predators, but Cook doesn’t say if that was the use in this case. The fact that he says “took our station on the poles,” leads me to believe this was not the first evening that they hunted the deer run from above. I read the passage that this was a late evening hunt, and that the two secured the bear at, or just after dark. Cook talks a lot about wolves and the fire was to keep them away from the bear until they could return. They “procured torches,” which indicates to me that they did not plan to be out after dark. But all of this is open to our 21st-century interpretation.